Our newest S/S 2011 collection, A Vintage Affair, is now live. This collection is full to the brim of beautiful, one-off pieces of vintage jewellery from the 1930s through to the 1980s. We've completely fallen for the gorgeous pieces of the past (just like we knew we would) and thought we'd put together a post showcasing our ultimate faves! 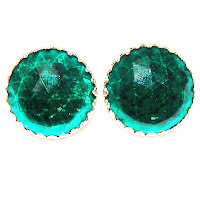 We adore these 1950s Emerald Green Glass Earrings, £12. So bright and elegant and simply perfect for cocktail hour. You wouldn't need any other jewellery to accompany these beauties, they do all the talking! 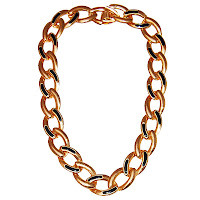 This 1970s Goldtone Link Necklace, £15, is just screaming out to be teamed with a jumpsuit and a pair of wedges. Perfect seventies attire! Such a statement piece, it's like wearing a work of art! 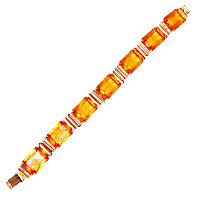 This 1970s Goldtone Amber Stone Bracelet, £15, is extraordinarily pretty. The amber stones are so striking and really catch the light. We feel this bracelet should be kept for very special occasions, anything less just wouldn't do it justice. 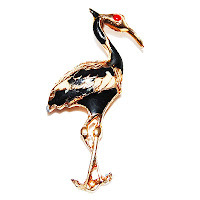 A definite fave from this collection would have to be this 1970s Enamel Stork Brooch, £16. As you know, we're head over heels in love with bird jewellery so this brooch is perfect in every way. We're passionate about its quirkiness and LOVE that it originates from the seventies. Beautiful! Have a happy vintage Thursday!